How I stopped worrying and learned to love Eric Eggert, @yatil Fronteers 2012 Jam, 03.10.2012 DEFAULTS I am Eric Eggert and I’m not talking about accessibility today. I'm talking about defaults and how they help to improve the workflow. WTF are DEFAULTS I think about defaults as decisions that I made befor a decision is even necessary. Compare it to my iPhone 5 purchase, once I ordered it, the itch to go into a store and buy one reduced. For oneself, there are three states of rules: first, there are general design principles, second, there are conventions, e.g. In teams, and third there are defaults. They are very personal stu ! . Grunt Adobe Edge VanillaJS Boilerplate Wireframes Photoshop Mockups Personas PubSubHubub Wordpress Drupal Contao CSS Filters Flash Bootstrap Boilerplate Moodboards Node GIT CVS SVN …WTF? I mean, that's a lot of stu ! , that you’d need to learn. And most of this may not even be applicable to what you do anyways. So I'd like that you stick to your choices more often, it will improve how e ! ective you are and may just produce good results. Consider Apple. You may hate or love them, but they use that principle and sticked to some default. The 30 pin connector lasted for a long time, and now, it's time to replace it with the shiny lightning connector. As you can see, it really is tiny, which was a requirement that Apple couldn't see until the iPhone5. Times changed and needs changed, so Apple changed its dock connector. 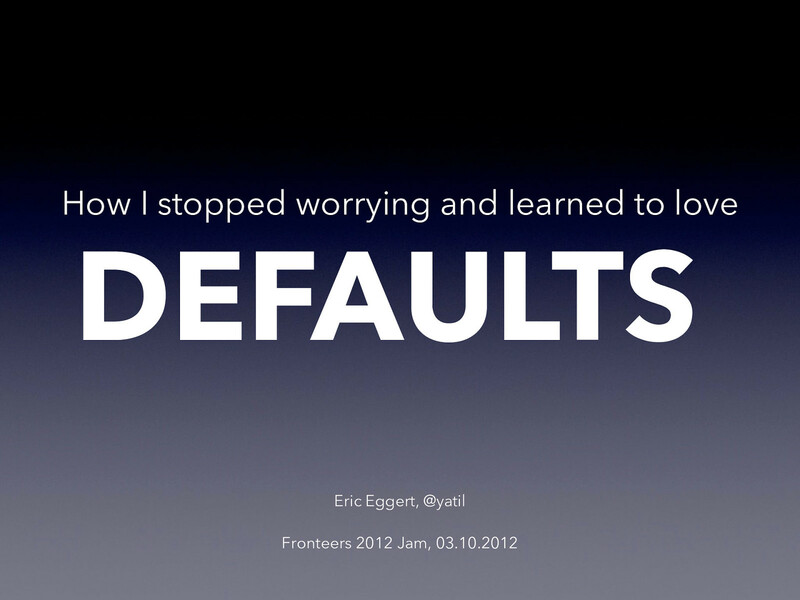 View How I stopped worrying and learned to love defaults. Choosing you defaults is important to have a good workflow. Making decisions all over again is bad for productivity and your lifestyle. In this session you'll learn how thinking about future decisions will improve work and life.